You know me and my ships! And a dandy one today sailed into sight. It is the English River! 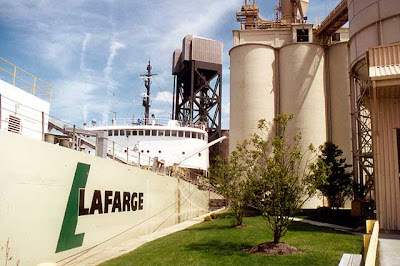 It is owned by LaFarge Cement. It is hard to see in the picture I hastily took from my desk but see the truck going over the Skyway? If you look directly down from that there is the ship. 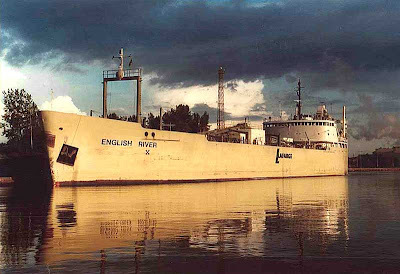 Here is a cool picture I found online of our new friend the English River on the Welland Canal. And another picture snapped in Buffalo. Here is a shot I like of the English River leaving Cleveland. It was built in 1961 and has a capacity of 5,200 tons. 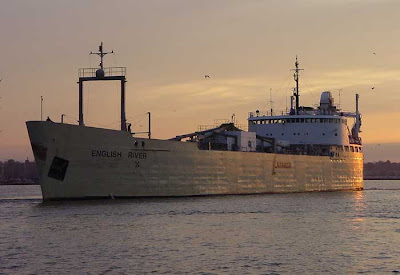 We do like our Great Lakes freighters here on the Leonard Pennario Web log. Remember the Herbert C. Jackson? And the Adam E. Cornelius? Slowly we are collecting more. This is more fun than bird watching! And it is exciting, because you never know when one will sail into view. You never know when your ship will come in! But the great thing was that the Building 215 which was the main building at that time, sat right on the water front and rose 18 stories. Only 15 of them were public spaces with the top 3 floors being engineering spaces. And I worked in engineering! The water was the Elizabeth River, Southern Branch and guess what was close to the hospital. The Norfolk Naval Shipyard! It was common to see aircraft carriers and everything of less size go right by. The carriers did not look like they could even fit into the river and towered high into the sky. There were interesting submarines and I even once got some good pictures of the Iowa, a great battleship many years ago. Wow! What am I doing? Sorry. The memories just flooded me, lol!